Tan Chunrui started learning the violin at 6 years old. Her teachers were Lynette Lim, Zhang Zhen Shan and Chan Tze Law. 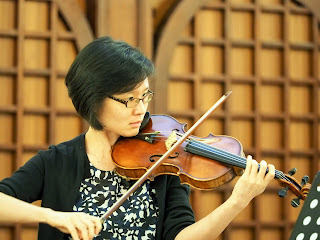 She obtained the Diploma in Violin Performance from ABRSM with distinction. With a strong interest in both science and music, she went on to pursue dual degrees in chemistry and music at Case Western Reserve University in Cleveland, Ohio. Under the tutelage of Dr. Carol Ruzicka, from the Cleveland Institute of Music, Chunrui was selected to perform Vieuxtemps Violin Concerto No. 5 with her university orchestra. An active orchestra musician, Chunrui has been a member of the Singapore Youth Orchestra, Cleveland Philharmonic Orchestra, Durham Symphony Orchestra (USA), Orchestra of the Music Makers, and ADDO Chamber Orchestra. She has also performed with the Metropolitan Festival Orchestra and Hallelujah Oratorio Society.